As much as I would like to avoid it, I am almost always driving during peak times – dropping the kids off to school at 9am and collecting at 3.30pm, and often driving to and from after school clubs at around 5/5.30pm when the traffic is heavy again. People driving too fast in a built up area, especially around schools and housing estates. People using a mobile phone when driving – it’s just so dangerous! Children not restrained properly in car seats – again, it’s just dangerous, and could be catastrophic. People driving close behind you trying to push you to go faster, or those who edge out to the side of you looking to overtake, when it is clear that it’s not a safe place to do so! There are so many good drivers out there, and the ones who frustrate me are in the minority – but it only takes one error, one silly mistake to cause an accident, and I do think we are all guilty of not paying enough attention sometimes. It’s hard when you have children in the car, who often shout, kick seats and drop toys while you are trying to drive, but it’s far safer to pull over and sort out any issues than try and reach behind seats or settle arguments whilst travelling. A recent survey by Cargiant reveals that many of us get frustrated by the same driving behaviours, with not using indicators being the top irritant. You can see the full survey here. What annoys you when you are driving? 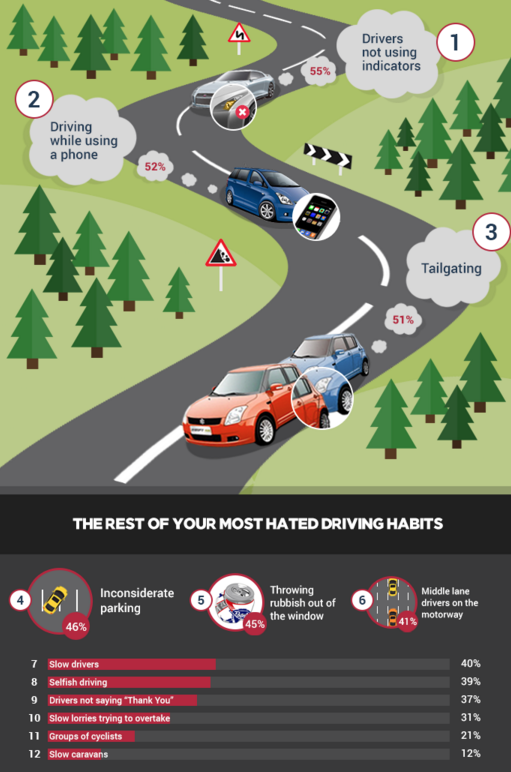 Are you guilty of any of the most hated driving habits yourself? Most annoying drivers in my opinion are the slow drivers. It drives me nuts. If you can’t follies the road rules stay at home. Also another thing annoying me is when go straight at the traffic lights and somebody from opposite direction trying to turn right before me. I mean seriously where did you get your license.